Author(s) Perrow, Martin R.; Davy, Anthony J. The two volumes of this handbook provide a comprehensive account of the emerging and vibrant science of the ecological restoration of both habitats and species. Ecological restoration aims to achieve complete structural and functional, self-maintaining biological integrity following disturbance. In practice, any theoretical model is modified by a number of economic, social and ecological constraints. Consequently, material that might be considered as rehabilitation, enhancement, re-construction or re-creation is also included. Principles of Restoration defines the underlying principles of restoration ecology, in relation to manipulations and management of the biological, geophysical and chemical framework. 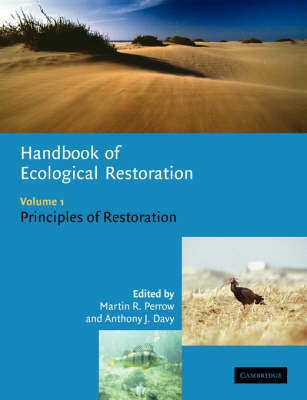 The accompanying volume, Restoration in Practice, provides details of state-of-the-art restoration practice in a range of biomes within terrestrial and aquatic ecosystems. The Handbook of Ecological Restoration will be an invaluable resource to anyone concerned with the restoration, rehabilitation, enhancement or creation of habitats in aquatic or terrestrial systems, throughout the world.